Audio For Drinking: "We lost it long ago, you and me"
"We lost it long ago, you and me"
So I totally have to cheat and be brief tonight because I picked up a fill-in gig this evening and am super behind on other stuff I should be doing. I actually wrestled with whether or not to include a song from the new Spoon album Ga Ga Ga Ga Ga. The group has become so consistent I sometimes actually feel that half-disappointment that's like already knowing what you're getting for Christmas weeks ahead of time. One way to really witness this would be to examine the group's arguably stiff live performance. I saw them twice this year (and countless times in years prior) and the experience is more less them delivering one memorable and catchy tune after another without injecting much personality into stage banter. It's almost puzzling considering the quality of some of the song-writing that that element would be missing. While it sounds like Ga Ga... featured some of the bands most commercial sounding pop songs to date, we recall that's this has come after the Stranger Than Fiction and Veronica Mars stints. Spoon's songs have been this crisp and user-friendly since Girls Can Tell and it's just been a matter of everyone else catching on. While I'm fairly sure Britt Daniel's favorite band is still Wire, I'm going to say Spoon has kind of turned into the Cars. It's black-tie pop rock that despite entering the mainstream, remains lively and hip. It's layered instrumentation that deceivingly sounds simple given an obvious stand-up job in the studio. And it's ironic because the turning point really seems to be when the group's former major label gave up on them that they became this sure thing of agreeable, memorable songs. Eventually these guys are going to have a killer anthology album with no bad songs on it. 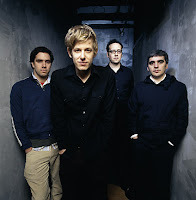 Spoon - download "You Got Yr. Cherry Bomb"